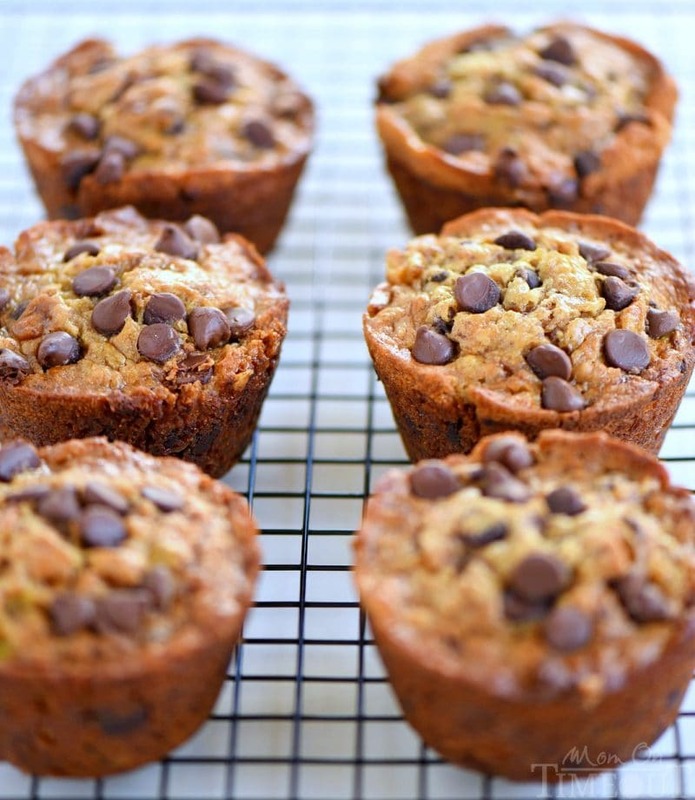 When life gives you ripe bananas – make muffins! 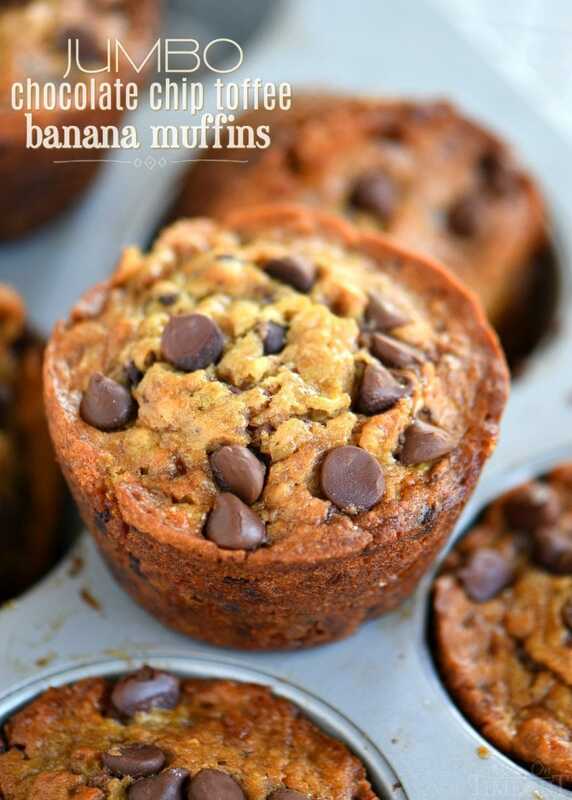 These Jumbo Chocolate Chip Toffee Banana Muffins are incredibly moist and just loaded with flavor! 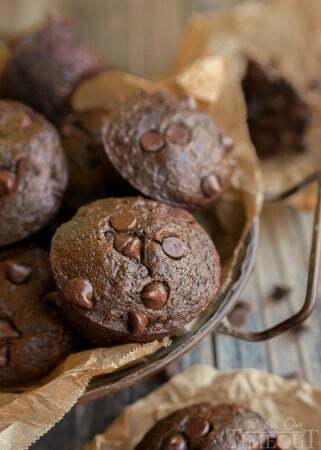 Chocolate and banana goes together so well in these delicious muffins! I’m a sucker for breakfast. It’s been my favorite meal every since I was a kid. I like breakfast so much I’ll eat it any time of day: brunch, brinner, bressert…all good! Muffins are one of those treats we don’t have for breakfast all too often but are much appreciated when we do. 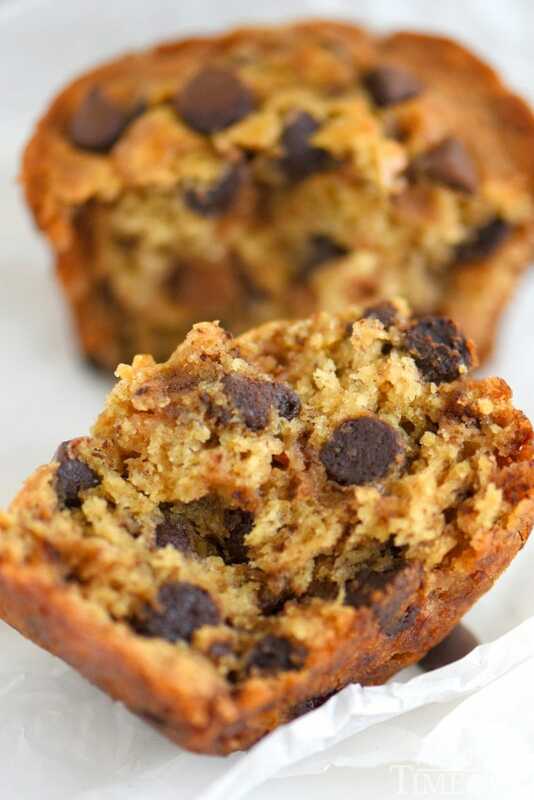 Today I’m sharing these Jumbo Chocolate Chip Toffee Banana Muffins which, if you happen to have a few ripe bananas lying around, the timing couldn’t be more perfect. 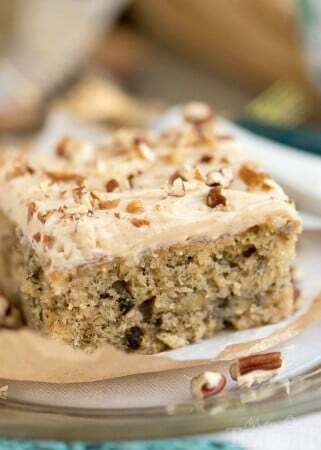 Ripe bananas prompt all sorts of delicious baking in our house like these Chocolate Peanut Butter Banana Cookies or this Chocolate Banana Applesauce Cake. Bananas add loads of nutritional value as well as a ton of moisture to baking recipes – they’re kind of awesome like that. I’ve got this jumbo muffin pan that doesn’t see a lot of action and I frequently feel sorry for it. Basically, it guilt trips me into preparing jumbo muffins or cupcakes. I know. I’m a push over. That being said, I’ve yet to regret making any muffin or cupcake jumbo size, like ever. These muffins included. Three whole bananas are used and honestly, what better use for those over ripe bananas than these jumbo muffins? 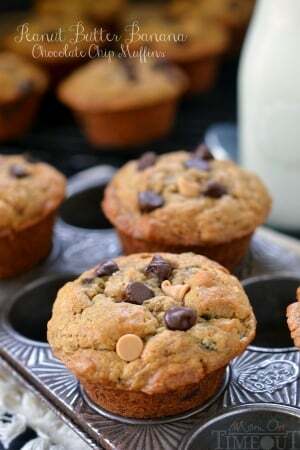 I loaded these banana muffins with chocolate chips and Heath Toffee Bits for an irresistible flavor that works for breakfast, snack or dessert! These muffins are going to disappear fast but if you’ve got a bunch of bananas to use up, make two or more batches and freeze. These muffins freeze beautifully! Save a few for an after-school snack – my boys love them! Feel free to mix and match add-ins to this recipe – I do it all the time 🙂 Butterscotch or peanut butter chips make a delicious alternative to the chocolate chips! Lightly grease a jumbo muffin tin or line with muffin liners and set aside. Peel and mash the bananas in a large bowl. Stir in the sugar, egg, butter, and vanilla extract until combined. Spoon batter into the prepared muffin tin. An ice cream scoop makes this job easy! Bake for 20 to 30 minutes or until an inserted toothpick comes out clean. 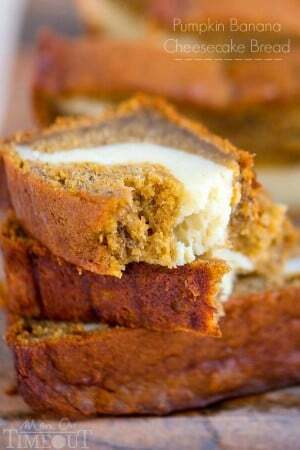 Don't have a jumbo muffin pan? No problem! Prepare as instructed above and spoon batter into a regular muffin pan. Check muffins at 25 minutes. Muffins are done when an inserted toothpick comes out clean. These muffins are delicious and so moist!😋 How can you go wrong with chocolate chips and toffee?! Will definitely be making these again! Trish, these are delicious! Made these as directed but used regular sized muffin tin. Baked 23 minutes and it made 18. So moist! I may try next time with butterscotch chips or no chips at all–just the banana and toffee bits. Definitely going into my “winner” file and will share on Facebook. Already pinned! Thank you!!! I’ve yet to regret making any muffin or cupcake jumbo size, like ever. These muffins included. muffins are looking very beautiful, will try it today. I love everything about these muffins! The bananas, the chocolate, the TOFFEE! I want to make some right now! By the way, I LOVE your new blog design! It is so colorful and beautiful and I love the way it is organized!